Help your friends’ and loved ones’ favorite movie stars come to them, by giving them the gift of entertainment – AMC Gift Cards! 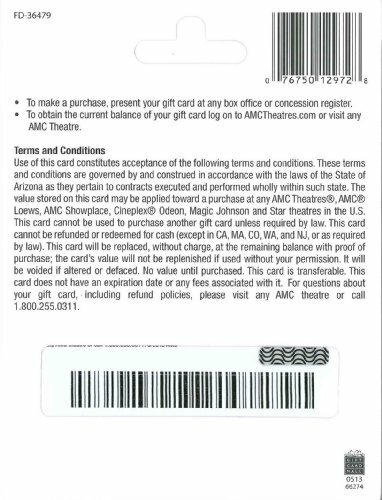 AMC Gift Cards are good for both movies and concessions and are reloadable at any theatre in the United States. 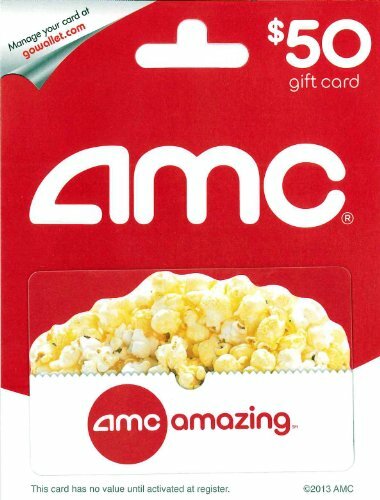 Even better, AMC Gift Cards do not have any associated fees or expiration dates so your gift spans the test of time. In the words of “Cousin Eddy” from “National Lampoon’s Christmas Vacation:” “That’s the gift that keeps on giving the whole year.” AMC, the first in the exhibition industry to offer personalized gift cards, was also the first in the industry to launch circuit-wide gift cards in 2002. We think that’s pretty cool too. Headquartered in Kansas City, Mo., AMC Entertainment Inc. is a leading theatrical exhibition and entertainment company. With a history of industry leadership and innovation dating back to 1920, the company today serves hundreds of millions of guests annually through interests in 350 theatres with over 5,000 screens in four countries. To make a purchase, present your gift card at any box office or concession.